Do you have difficulty with your daily tasks due to foot or ankle pain? Is it affecting your job? Is it affecting your quality of life? Over the last 10 years I’ve been working on daily basis to help people aged 35+ find relief from acute AND chronic foot and ankle pain – and what I can tell you is the unhealthy cocktail mix of more rest and more painkillers will do absolutely nothing to get to the root cause of most types of chronic foot and ankle pain… no matter what most physician’s say! And it’s because I’m growing increasingly frustrated with the number of people suffering unnecessarily that I’ve written a guide that details the 5 things ANY person can do to relieve foot or ankle ache or pain, naturally… and I want you to have it at no charge. 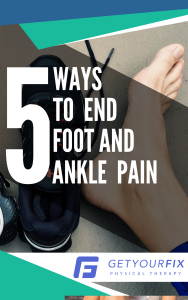 Now, I don’t know if these 5 things will relieve you of your foot or ankle pain completely. If your foot or ankle pain is affecting your job, your ability to keep active threatens your independence or hinders family leisure time… then you really need to read this free guide.